Diabetes describes a group of metabolic diseases which cause high blood sugar levels. In recent years, diabetes has become one of the leading causes of deaths worldwide. According to the World Health Organization, around 1.6 million people worldwide died due to diabetes in 2016. It is estimated that 425 million people are living with diabetes all over the world. By 2045, projections show this number rising to some 629 million diabetics globally. Interestingly, countries with the highest prevalence of diabetes can be found primarily on islands in the Pacific and in the Middle East. For example, on the Marshall Islands almost a 33 percent of all adults have diabetes. In comparison, diabetes prevalence in OECD countries remains much lower. However, the United States reports figures significantly above average for OECD countries with a prevalence of around 13 percent. Over 23 million people in the United States have been diagnosed with diabetes, with the real number estimated to be even higher. In the U.S., a disproportionately large number of people in the Southern states suffer from diabetes. From an ethnic view, non-Hispanic blacks have the highest prevalence in the United States, with around 13 percent of this population suffering from the disease. Worldwide, health care expenditure to treat diabetes was estimated at almost 730 billion U.S. dollars in 2017. Thus, diabetes treatment is also a huge pharmaceutical submarket. 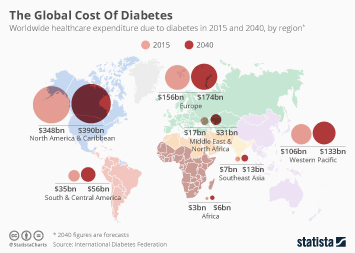 In 2017, global anti-diabetics revenues totaled to 72.2 billion U.S. dollars. Novo Nordisk is the leading pharmaceutical company based on global anti-diabetic revenue. The Danish company is highly concentrated on the manufacturing of drugs for diabetes treatment.